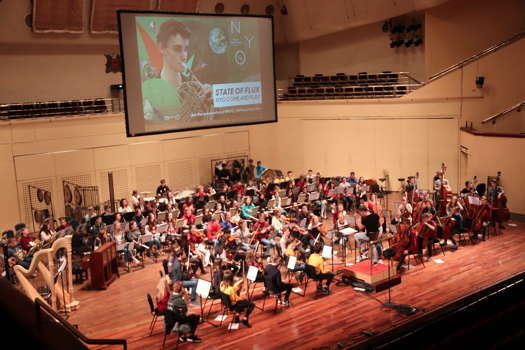 A humdinger of a concert from the National Youth Orchestra of Great Britain is getting to be a welcome regular start to the new year for Nottingham audiences. On this occasion - Royal Concert Hall, Nottingham, UK, 7 January 2019 - conductor Kirill Karabits presided over an inventive programme comprising two recent pieces, one of which is pretty well a modern classic, and a familiar, standard-repertoire symphony. 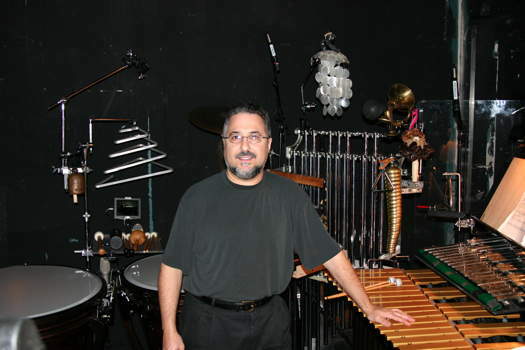 Rick Dior teaches percussion at the University of North Carolina. Science Fiction is a homage to his favourite schlocky science fiction horror films of, mainly, the 1950s, accompanied by a continuous sequence of appropriate clips including, also, nods to Metropolis, Nosferatu, and Orson Welles' 1939 radio dramatisation of The War of the Worlds that apparently scared half of America witless, and ending with images from the first Moon landing. Originally for twelve percussionists, Science Fiction was re-scored by the composer for wind, brass, percussion and harps specially for the NYO, retaining its original (I guess) focus on metallic percussion, as it seethes and pulses its way through a sequence of giant octopuses, flying saucers and vampires. Dior quotes the 'Dies Irae' chant at one point, and includes parts for theremin (used by Bernard Herrmann in his score for The Day the Earth Stood Still - plenty of clips from that one) and rhythmic hand-claps, provided by the NYO's otherwise unoccupied string players from the choir seats. After the sound and fury dies down, he leaves us with a long, gently bubbling fade-out. It was all great fun, highlighting the ropey special effects, hyperbolic voice-overs and captions, and over-acting, of the originals. To cover the platform re-set, those same string players filed on in front of the stalls playing a link built, I'm told, from improvised tunes and riffs they created during rehearsals, and ending with a couple of themes from Sibelius' Second Symphony to be played in the second half. They then joined their colleagues on stage for John Adams' Doctor Atomic Symphony, which draws on music from his opera focusing on Robert Oppenheimer, the scientist in charge of the project to build the first atomic bomb. With the pulsing raw, energy that informs much of the first two movements, somebody, somewhere has probably already thought of labelling it a '21st-century Rite of Spring'. The NYO players gave it all they'd got, but their sensitivity in the quieter moments was equally compelling. As 'The Laboratory', the first of the three movements, fades, flickers of piccolo cut through to calm things down, and there was a deep stillness to the quiet music that followed. Then, with 'Panic', the second, and by far the longest, movement, seething motion takes over. Principal trombone Lawrence Schofield stood for his commanding solo, and principal horn Annemarie Federle was elegiac and wistful at the movement's meditative centre. The last movement, 'Trinity', takes one of the opera's key moments, Oppenheimer's big meditation ending Act 1 - a setting of John Donne's sonnet 'Batter my heart, three person'd God'. Here it is a trumpet solo, eloquently and movingly shaped by Holly Clark amid the surrounding edginess that repeatedly cuts in. The gesture with which Adams slams the symphony shut was delivered with whiplash precision. Sibelius' Symphony No 2 got off to an impressive start, the strings hitting the ground running with their warm vibrant sound. Gradually, though, doubts crept in, as the performance started to feel a little too fast and hard-driven, and important details were often submerged. There was some really eloquent playing in the second movement's soft string passages, but the turbulence elsewhere was often reduced to an undifferentiated buzzing, and the rather hectic manner diminished the impact of those passages where Sibelius really does want things to hot up. On the other hand, Karabits and the players kept the music quietly on the boil through those passages in the finale where Sibelius allows the energy to drain away, and where the momentum can easily sag if the performers aren't careful. The Second is sometimes described as Sibelius' farewell to the world of the big romantic symphony. This performance was all a bit larger than life, and seemed to underline, in a back-handed sort of way, that he was really a classicist all along. None of this, of course, detracts from the orchestra's playing. The evening belonged to these fabulously gifted instrumentalists, and once again we were left marvelling at this powerhouse of collective talent that blows audiences away wherever it goes. This was the last concert of the orchestra's three-date tour. The first, from the Warwick Arts Centre, was recorded by BBC Radio 3 and broadcast on 14 January.